The Ultra Carver......Two Thumbs Up. This is my first review so bare with me. I have read so many articles and website about power carvers it is unreal. What I have found is that you can go small (30,000 rpm) or go big (300,000+ rpm). Let put a scale, 1 through 5. 5 being the best while 1 being, you got it, I wouldn’t give it to my worst enemy. If you watch the infomercial that is posted on the website, pay no attention to the price it says. The informercial lists it at 3 payments of $69.95 ($209.85). By the looks of the VHS is the picture, this looks to have come out in the 90’s. Seems to me, the tool is made of high quality plastic. Still holding strong. When ordering the Ultra Carver, you are lead to believe that a VHS comes with it (looking at the pictures). But they have upgraded to a DVD, which looks to be copied from the VHS. Poor video quality and there should be a warning that you should not operate heavy machinery while watching. It is boring but give you an idea of how to operate the Ultra Carver. The Ultra Carver, unlike other power carvers, operates on a household vacuum. Depending on the vacuum you have, it is noisy. The Ultra Carver is very powerful at 125,000 rpms. It is to be used as a detail carver or light carving. Engraving, detail and egg carving is the best use for it. 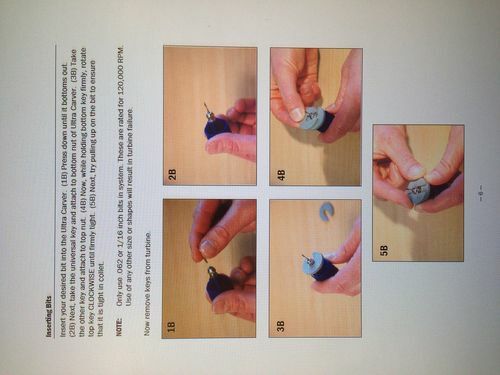 All and all, this is a great tool for someone that wants to try engraving or egg carving. Thank you so much for posting this, I have scoured so much of the internet looking for someone who bought this product and I think you’ve convinced me. thechipcarver, I called the number and it seems the company is now scm enterprise, so I’m not sure if they have this product any more. Have you had any issues with service or ordering parts for your carver? Are you still satisfied with it? Rose_red- I have order some bit from SCM but also have looked around on e-bay. I have found it is easy to find bits when I searched dental tools/ bits. The main problem I found is finding the right shaft size. But they are out there. lilchipper- Yes, they are under SCM. I have not had to “service” the tool but I have placed several orders with them. The shipping is a little high but very fast. The first order I placed was just for 2 of the tools. The S&H (I believe) was $14.99. But the second order I placed was for two tools and 12 bits and patterns, still only $14.99. thichipcarver, you say you ordered 2 of the tools? Do you mean 2 more ultracarvers? If so, may I ask why? I know they are cheap, but why more than one (except for maybe a backup). Also, how well does this carve glass as well as wood? I know SCM has a 400,000 RPM tool for $400+, so I am hoping this one will be fast enough. I bought the first two tools, one for me and one for my mom. I liked it so much and I guess I was bragging so much about it at work, two co-workers wanted to get one. So, we combined an order. 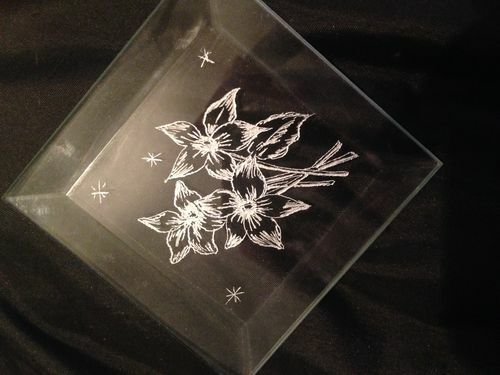 Here is a picture of my first attempt of etching on glass with the tool. I have not done any woodcarving with it. But I have used it on glass and egg shells, I would say you can’t be doing heavy carving (wood removal) like with a Foredom or Dremel. It would be more for detail carving on wood. Ah ok, that’s helpful, thank you for posting it. I was hoping it had or could adapt to a quick change bit. I guess it’s the old fashioned way. I like to change between many different kind of bits so I guess it’s going to be a pain for me. Thanks. At sixty bucks, this could be a fun experiment. I have always used conventional hand carving tools but I have always wondered about on some projects how powered tools might fit the bill. Thanks for posting this. Around the corner I may want to take a look. I’ll just mark this post with my favorites. Thanks for posting. can this item be purchased in the uk ot at least shipped to the uk? Looked on their webpage by seems to only ship to usa and canada.